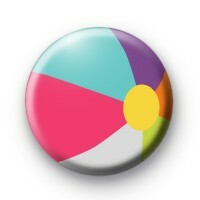 Beach Ball Button Badge. The perfect badge for summer holidays with the family. This badge has an illustration of a beach ball on it in pink, blue, purple, orange, green and white. Great for summer holidays and beach or Hawaiian themed parties. 25mm button badge.